V.A. - "Live At Wacken 2008"
Right before this year´s anniversary festival, the DVD of the W:O:A 2008 will be available in the shops. So you can use it either to recall last year´s open air or to get in the right mood for the one to come. On “Live At Wacken 2008” you can find among others live clips from Exodus, Nightwish, Axxis, Job For A Cowboy, Holy Moses, As I Lay Dying, Carcass, Corvus Corax, Leaves´ Eyes, Ensiferum, Gorgoroth, Van Canto and the Metal Battle winners The Fading. 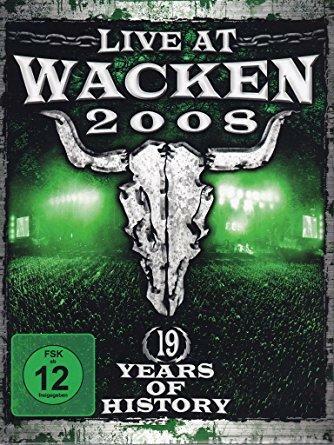 "Live At Wacken 2008" will be available as Double-DVD including Live-footage, interviews and backstage moments. This year's Wacken Open Air has just come to an end and was a huge success - the double-DVD of the 17th W:O:A (2006) can already be bought as well. Both DVDs are filled with an intensive festival documentation with pictures of the warm-up-party, after show party, big reviews of each festival day, interviews, press conferences, backstage scenes and much more. Not to mention, the music does not come short: More than 40 bands and more than 60 songs can be found on more than 6 hours of DVD. Part of the show are for example Legion of the Damned, Nevermore, In Extremo, Soulfly, Rose Tattoo, Children of Bodom, Ministry, Amon Amarth, Emperor, Motörhead, Subway to Sally, Scorpions, Celtic Frost, Holy Moses, Carnivore, Metal Church and many more.